Posted Sep 02, 2016 By The Incidental Economist Austin Frakt, Ph.D.
Syringe exchange programs (SEPs) provide free, sterile injection equipment to injection drug users and collect their used equipment. SEP's primary purpose is to reduce the blood borne infectious disease like HIV and hepatitis B/C, all of which are disproportionately prevalent among injection drug users. Some programs also offer other services (e.g., condom distribution, infectious disease testing and prevention education) and can be a gateway to drug treatment programs. The preponderance of evidence suggests that, for all these things, they work and that they're cost effective or even cost saving. Let's review. Improving Injection-Related Practices. Many studies show that injection drug users who visit SEPs use safer injection practices. A meta-analysis of 47 studies by Ksobiech (2003) found that needle sharing and borrowing declined among SEP visitors. Hagan et al. (1993) interviewed over 204 users of a Takoma, Washington SEP. They reported no change in injection frequency, but a decline in injections with used equipment. After Vancouver increased its distribution of clean syringes, it experienced 40% declines in syringe borrowing and lending, according to Thomas Kerr et al. (2010). Reducing Blood Borne Viral Infection. Safer injection practice is a process measure. Does it translate into reduced incidents of infectious disease among injection drug users? There's a lot of evidence it does. Hurley et al. 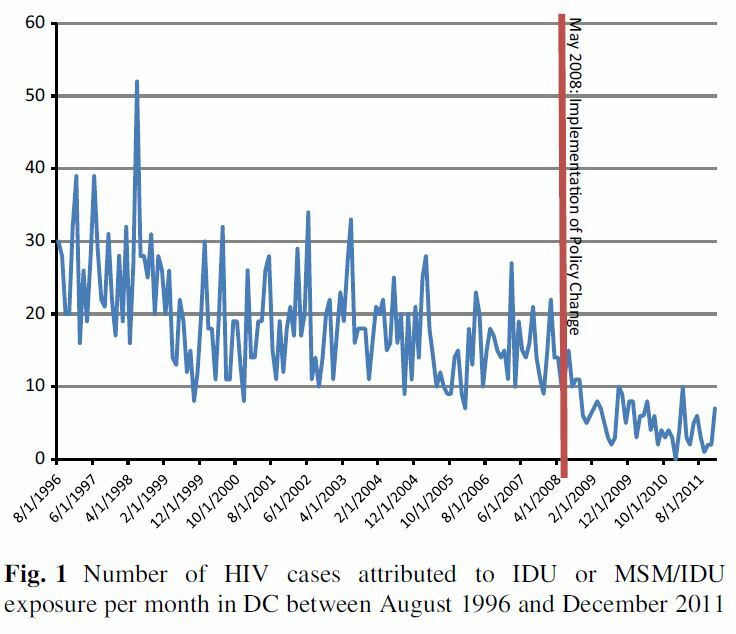 (1997) compared changes in rates of HIV infection among injection drug users in 29 cities with SEPs to 52 cities without them. In those with SEPs, the HIV infection rate fell an average of 5.8% per year compared to a 5.9% annual increase in those without SEPs. Hagan et al. (1995) studied injection drug users who did and did not use a Tacoma, Washington area SEP — one of the first to open in the late 1980s. Not using the SEP was associated with six and seven times greater risk of hepatitis B and C infection, respectively. However, this was a relatively small study, with only about 50-60 subjects, depending on outcome. A much larger study — of over 1,600 subjects — by Des Jarlais et al. (1996) found that injection drug users who didn't visit a New York City SEP in the early 1990s were over three times more likely to contract HIV, compared to those who did visit one. Kwon et al. (2012) estimated that, among injection drug users, SEPs in Australia reduced cases of HIV and hepatitis C by between 34-70% and 15-43%, respectively. For the WHO and in a separate, similar paper, Wodak and Cooney (2006) reviewed and assessed the SEP research literature, concluding that SEPs reduce HIV infection substantially. 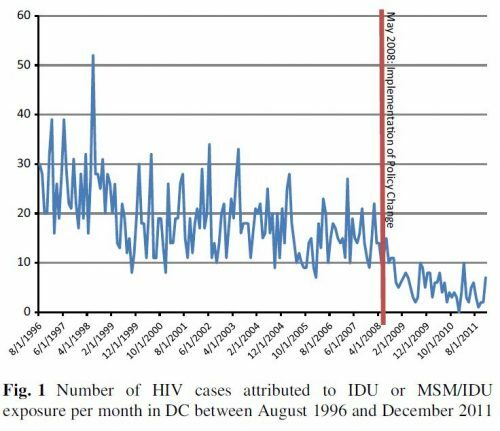 HIV incidence fell after Vancouver increased its distribution of clean syringes (Thomas Kerr et al. 2010). Not Increasing Injection Drug Use. A significant concern among many is that the provision of free, clean injection equipment will promote injection drug use. The research says it won't. That's the conclusion from the literature review by Wodak and Cooney (2006) who wrote, "[A]fter almost two decades of extensive research, there is still no persuasive evidence that NSPs increase the initiation, duration, or frequency of illicit drug use or drug injecting." Hagan et al. (2000) found that, relative to those who had not visited a SEP, Seattle-area injection drug users who had were more likely to report a reduction or cessation in injection. Guydish et al. (1993) compared San Francisco drug treatment admissions two years before to two years after SEP implementation (1987-1990). According to the study, SEPs were not associated with increasing drug use (overall or injection-based) or needle-sharing behavior. However, "[n]eighborhoods without needle-exchange sites showed a greater increase in proportion of admissions for injection drug use, and in frequency of injection, over time." In an analysis of about 5600 San Francisco injection drug users over 5 years, Watters et al. (1994) found that frequency of injection fell and average age of injection drug users rose as a higher proportion of them used SEPs. These findings do not support the hypothesis that SEPs promote greater injection drug use. Promoting Drug Treatment. SEPs are an effective way to reach a population in need of drug treatment. Wodak and Cooney (2006) conclude that there is reasonable evidence that they increase recruitment into drug treatment programs. Hagan et al. (2000) found that "[n]ew exchange users were five times more likely to enter methadone treatment and ex-exchangers were 60% more likely to remain in methadone treatment over the 1-year study period." Among Baltimore injection drug users, those that had attended a SEP were more likely to enter a drug treatment program, according to work by Strathdee et al. (1999). Cost-Effectiveness. In their literature review, Wodak and Cooney (2006) conclude, "a number of careful studies in several developed countries and some transitional countries have demonstrated convincingly that NSPs are cost-effective." However, they're more than that — they're cost saving. According to Holtgrave et al. (1998), providing every injection drug user with all the clean needles he or she would avert enough HIV cases to be cost saving. Lurie and Drucker (1997) estimated that a national implementation of SEPs would avert up to nearly 10,000 HIV infections, saving over three-quarters of a billion dollars in current dollars. Ruiz et al. (2016) estimated that a policy change that permitted use of Washington DC municipal funds for SEPs saved the city over $44 million in averted HIV cases. In their study of Australia's SEPs, Kwon et al. (2012) calculated that a dollar invested in them returned $1.3 to $5.5 in averted health care spending. A SEP in Ontario saved four times more than it cost, according to Gold et al. (1997). Cabasés and Sánchez (2003) estimated that a SEP in Spain was saved more than it spent, again due to averted HIV cases. Some studies differ. It is important to acknowledge that findings contrary to some of the above exist. For this reason, in a review of reviews, Palmateer et al (2010) found "insufficient" and "tentative" evidence to support effectiveness of SEPs in preventing hepatitis C and HIV transmission, respectively. This, however, is not the same thing as concluding SEPs do not reduce transmission. Additionally, as discussed in Wodak and Cooney (2006), studies that don't find SEPs effective in preventing transmission of these diseases are more likely to have been conducted in settings in which injection drug users have legal access to syringes through local pharmacies. "[I]n settings with [SEPs] but without additional legal access to sterile injecting equipment, there were no negative or null findings," they wrote. This only reinforces the idea that access to clean needles by some mechanism — SEPs and legal sale at pharmacies among them — is an effective means of improving public health and saving downstream health care costs.